The island of Curaçao in the Netherlands Antilles (Dutch Antilles). Scale: 1 : 75.000. 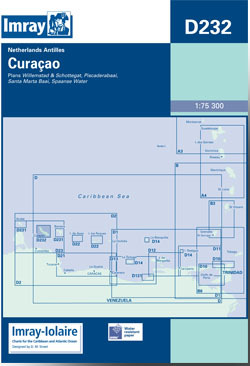 Larger scale plans of Spaanse Water, Santa Marta Baai, Willemstad and Schjottegat, Piscaderabaai. Flat chart, water-resistant paper.